The focus of the new Education White Paper (WP) is advertised in the title: “The Importance of Teaching”. Teachers are rightly lauded as the most important single factor in creating a good education. The reforms relate principally to training new teachers, with additional discussion of the constraints and bureaucracy that teachers face. The White Paper calls for shifting the emphasis of teacher training from university-based to school-based training, the argument being that this is where the “craft” of teaching is better learnt, and that this will generate more effective teachers. We believe that the WP presumes more robust evidence on this issue than actually exists. It is hard to legislate on the best way to train teachers when we are not really sure what makes a good teacher, or what effective teachers do. We need to be realistic in terms of what we know, and also in terms of the wider context around teacher development. There are a number of prior questions that need more robust answers than they currently have to properly address this policy issue. For example: To what extent are good teachers born or made? What do effective teachers do? What motivates teachers? We discuss new teachers first and then existing teachers. The two key issues around new teachers are recruitment and training. The research evidence suggests that the recruitment of teachers matters a great deal. This evidence can be used to design the ideal personnel policy, the ideal contract for teachers. The facts are that teachers are very different in effectiveness but that this is hard to spot pre-hire as it does not appear to be well correlated with characteristics such as degree class or subject; and that this level of effectiveness tends not to increase with experience after the first two or three years. The current teacher entry system involves making the sharpest selection before training (to be raised to a good university degree), giving training, but thereafter only mild selection: that is, most people pass their training, and then passing probation (achieving QTS) is relatively straightforward in most schools. The evidence suggests a better policy would be exactly the reverse: a much more open and inclusive approach to who can begin teacher training, coupled with a much tougher probationary policy. It is hard to give strong advice about a model for teacher training, given only a sketchy idea of how effective teachers operate. But in practical terms, students on teacher training courses already spend about two thirds of their time in school rather than in the university lecture hall; the scope for major gains from further time in school does not seem large. Furthermore, a timely OFSTED report on initial teacher training found more outstanding university-based teacher training courses than outstanding school-based ones. The implications for schools of taking a larger role in teacher training also need some consideration, particularly given the squeeze in resources that is coming. There are about 400,000 teachers in England, and the turnover is about 20,000 per year. So even if the average effectiveness of new teachers can be significantly improved, this will only have a marginal impact on overall effectiveness for at least a decade. Increasing the effectiveness of existing teachers offers much greater scope for rapid improvements in standards. The counter-part to focussing initial training on schools is to emphasise and enhance training on the job, continuing professional development (CPD). The picture painted by the economics evidence suggests a model of informal, small-scale, within-school or even within-department groups would work well, with colleagues learning from the most effective teachers. Whilst CPD is discussed at some length in the WP, it has not been the focus of interest and discussion that it should be. The broader question is why this has to be pushed towards teachers, why there isn’t much of a demand for it from most teachers. Raising the value of being an effective teacher might help fuel this demand. We know that teachers do raise their teaching effort given incentives, and it seems likely that they would also be keener to invest in their own capability to be effective. This incentivisation could be very simple and need not be personal financial gain. It could be simple pride and satisfaction from being top of a list of teachers in the staff room, or additional resources for a project chosen by the teacher, or it could be a pay bonus for the teacher. The focus on teachers and teacher effectiveness is to be applauded. It is less clear that the right policies have been selected to enhance this. The Coalition government is concerned about public sector pay and has instigated a review chaired by Will Hutton. Hutton has signalled that he will be looking at it the level of pay, both across sectors and within the public sector. However, one issue on which there have been fewer pronouncements to date is the regional variation in pay within the public sector. Pay in the public sector for doctors, teachers, nurses, armed forces and other public sector workers is set by the Pay Review Bodies. These bodies review the state of the labour market and recommend a level of pay for to the government and the unions each year. Public sector unions often stress fairness in their wage negotiations: the commonly articulated view is that a teacher in an inner city should in Newcastle does the same job as one in inner London and should therefore be paid the same wage. Perhaps as a result of this argument the review bodies basically set one wage for all the workers they cover, regardless of where they are located in the country. There are extra increments for those located in the South East and London, but these tend to be small. The result is that wages in the public sector tend to be much ‘flatter’ across geographical space than private sector wages. As an example, the difference in the pay of a nurse located in the North East and London is around 15%. However, the difference for a private sector employee with similar skills to a nurse is in the order of 40%. Such large gaps are likely to cause recruitment and retention problems for public sector employers in the South East as their workers live in a high cost area and as a result will be offered higher wages in the private sector. Shortages of nurses and teachers in the South East have been an ongoing and well documented problem. But is is likely that these recruitment and retention problems also have a knock on effect into the productivity of public sector services in high cost areas. Shortages of workers, high turnover rates and perhaps low levels of morale as a consequence, are likely to cause production problems. CMPO research on nurses’ pay has confirmed this intuition: centralised regulation of nurse pay caused extra deaths per year amongst patients admitted to hospital following a heart attack. They also calculated that wage regulation didn’t even save the government much in direct wage costs as the benefit of lower wages bills in the South East was offset by higher pay in the North of the country so the wage savings were small. The reason for the small wage savings were that the pay review body gets the level of wages ‘right’ on average – what they get wrong is the extent of variation across different parts of the country. These seems very plausible: the review body takes evidence from a wide variety of sources and probably therefore sets the average level correctly, but in responding to union (and perhaps also public) pressure for equality in the public sector, gives insufficient weight to regional variation. It is likely that public sector pay regulation affects the ouput of teachers, policeman and other public sector workers in a similar way, though this is still to be confirmed. This all suggests that in addition to examining the level of public sector pay, Hutton should be equally concerned with the variation in pay across regions. One solution might be to deregulate pay altogether and let each employer negotiate with their local workers. However, this also has costs. First, and most obviously, such wage negotiations are costly for both employers and workers in terms of time and the need for each employer to employ HR personnel skilled in wage negotiation. But second, in labour markets in which there is a shortage of workers, negotiations between single employers and their workers may simply drive up the price of labour for all local employers as employers seek to outbid each other to attract staff. This means that no single school or hospital will wish to engage in such negotiation, because any advantage they initially get from offering a higher wage, will be quickly eroded as other local employers follow suit. Whether for the first and/or the second reason, it is the case that hospitals in England, when given the freedom to negotiate local wages in various NHS reforms have generally not done so. The solution might be therefore to retain the pay review bodies but to ensure that they allow for much large wage differentials across the country. In so doing, they will have to resist calls from the unions – and possibly the public – for equity in pay setting. But far from being fair, such equity penalises public sector workers in high cost areas, over-reward those in low cost areas and probably harm the users of the services these workers provide. Will Suffolk County Council’s out-sourcing of its activities work? Suffolk County Council is aiming to outsource almost all of its council services in an effort to save 30% of its budget. It has said that it wants “reduce its size, cost and bureaucracy and build community capacity to enable Suffolk citizens to take greater control of their lives”. Outsourcing has been a growing industry both in the private and public sector but what is unusual about this initiative is the scale of savings that are targeted and the fact that virtually all activities are to be outsourced. Is it likely to be achievable? Considerable savings from outsourcing standardised activities such as waste collection and maintenance have been identified over the years but not savings of the scale envisaged here. 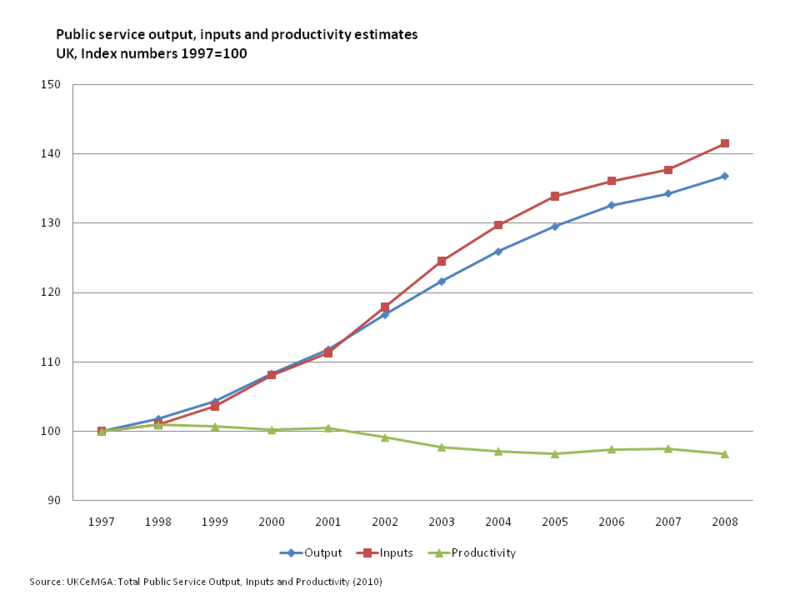 Furthermore, as more and more councils shift over to private suppliers there is some evidence that the gains from outsourcing are smaller, since the remaining traditional public delivery activities feel pressurised and are more efficient than in the past. Also, as the PPP experience has shown, it is the basic stuff where the biggest gains have been identified. As outsourcing bites into more complex operations cost cutting gains are likely to be harder to come by. And one of the advantages, or disadvantages depending on how you look at it, of outsourcing is that private supply with long run contracts cannot be switched off overnight. So PPP schools are all pristine because the contract says so, whereas state schools suffer from inadequate maintenance because it is an easy way to cut costs. But then private contracts ensure that promises are carried through, which is not the same thing as saving lots of money when needed. So if Suffolk is going to get anywhere near the targeted savings I suspect they are going to have to shift over to volunteers in a very big way. It is not clear whether this can be done on a large scale and or whether this will be sufficient to reduce cost by a third. There is evidence that the idea of ‘social enterprise’ delivery sells well with the public compared to private delivery of public services but it is less clear that it is more efficient. There is clear evidence that employees who ‘go the extra mile’ are far more common in third sector organisations than for–profit. However, what evidence there is suggests that these employees are drawn to the third sector and that they ‘go the extra mile’ wherever they are. This may also be true for volunteers. If someone volunteers for the local library instead of going to the Oxfam shop the local library is now cheaper but there is a cost for someone else, in this example for children in Africa. It appears that Suffolk may have set itself an overly ambitious financial target. Welcome to the CMPO Public Service Reform blog, CMPO Viewpoint. There has always been intense and passionate argument about how best to deliver public services. Working out how to provide effective and responsive services within a reasonable budget has been described as the “holy grail” of politics. That was in the good times. The current debates on how to reform public services take place in a context of severe fiscal austerity. This is very evident in the UK with the newly-elected Conservative-LibDem Coalition producing radical new plans across the public sector, alongside major budget cuts. But it is true worldwide too, with many governments struggling to get their public services producing more with less. There are many unanswered questions: can very significant budget cuts be implemented without a deterioration in the quality of service? What will be the effects of the new institutional reforms in schools, health care and welfare provision? Can GPs essentially manage the NHS? Will free schools revolutionise education in this country? Who will budget cuts hurt the most? Has the time come for a truly radical reform of welfare? How do these and past reforms affect social mobility and access to the best jobs in society? We at CMPO will play our part in addressing these questions, bringing evidence and insight to the issues. This new blog is a way of providing timely and informed contributions to the debates. This is where CMPO members and associates can offer commentary on current issues, a summary of the scientific evidence on particular topics, plus new research results. We will obviously continue with the day job, producing the lengthy scientific papers that are the backbone of our research, but we also have a duty and a wish to communicate the results of that research as widely as we can. We hope that this new venture adds an extra dimension to our contribution to policy-making.